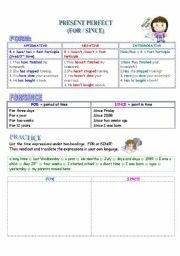 The worksheet presents adverbs and adverbial phrases of time, manner and place and the order they appear in in a sentence. A little theory and two easy exercises for your students. 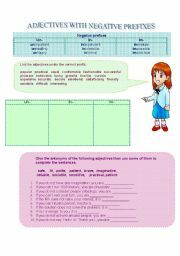 Worksheet for elementary students. They have to recognize nouns in context and decide whether they are countable or uncountable. 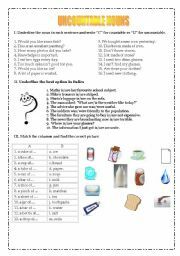 Then an exercise in I used specific quantifiers (a bar of..., a slice of...). Hope u like it and use in class. 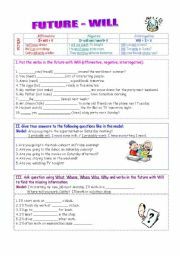 This worksheets contains exercises with the structure of the verb in the Present Perfect Simple and its the use of For and Since. 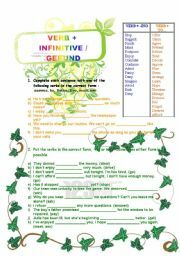 It is useful for students that begin the study of this English tense. 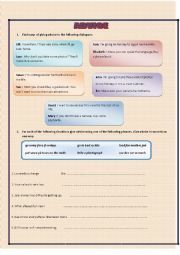 This worksheet invites Students to identify ways of giving advice (Why don�t you...? ; You should...; Make sure ...; Zero Conditional (If+ present.... imperative); then use them in sentences of their own. I hope your Students will enjoy it. 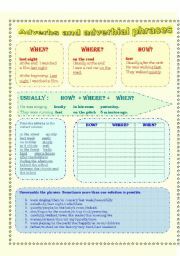 A worksheet you can use to revise comparison of adjectives. 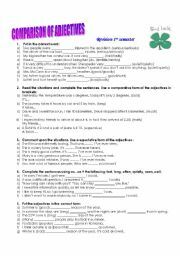 Also a little multiple choice exercise with -ly adverbs. Enjoy! Negative prefixes (un-, in-, im-) for adjectives. Enjoy! Would / Could / Shall I ...?